Oh what a day of racing we had today, and it will set up some intense racing in the days ahead! As you can see from the profile, we had a long day in the mountains with the massive HC Port du Bales 20km from the finish. An early break of ten riders took an eight minute lead to the base of the climb, and then immediately exploded. Crowd favorite Thomas Voeckler rode strong, preserved two minutes of the gap to the summit, and soloed down the back for a well-deserved stage win. Meanwhile behind him the real fireworks were exploding, as Team Saxobank ground the peloton down into just the GC leaders. With 5km to go Andy Schleck attacked! and had pulled a gap when suddenly his chain came off. (Replays were inconclusive as to why, but it looked like maybe the retractor on his back derailleur caught the chain.) 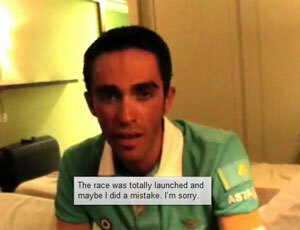 Immediately after Alberto Contador attacked himself, taking Denis Menchov and Samuel Sanchez with him. After futzing with his chain for about 30s Schleck remounted and chased, getting back to within 20s at the top. The descent was amazing, with Contador, Menchov, and Sanchez all taking turns pulling to open a gap, and Schleck and Jorgen van den Broek working to close it. The result was a 49s gap at the finish, putting Contador into yellow for the first time this tour, by 8s. There will be a lot of controversy over whether Contador should have stopped and waited - Team Cervelo owner Tweeted "Contador just gained a great chance to win, but he lost the chance to win greatly". My initial reaction was that it was bad luck, and that's racing, but on further review I think Contador might have waited just a beat or two to see what had happened. Menchov and Samuel probably would have waited, too. Still in the heat of the moment you have to react, and Alberto reacted like he always reacts to anything - by attacking. It all sets up a great battle in the queen stage tomorrow, with two Cat 1s followed by two HCs over 200km. By all means stay tuned!